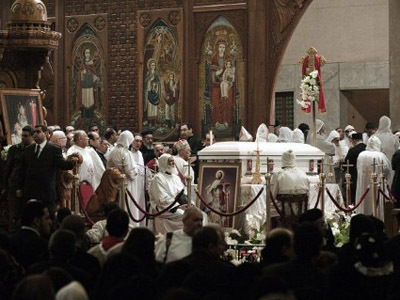 Coptic Christians have paid final respects to their spiritual leader. 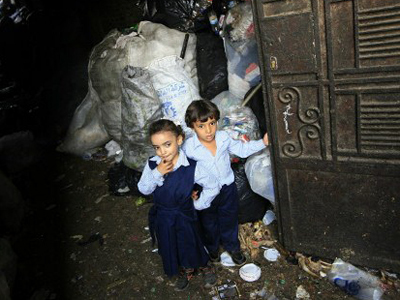 With the death of Pope Shenouda III, a staunch defender of the Christian minority in Egypt, millions of Copts face growing uncertainty about their future in Muslim-ruled Egypt. ­Pope Shenouda III died on Saturday at the age of 88. Hundreds of clerics, deacons and lay people gathered around the casket at Saint Mark's Cathedral in Cairo, while thousands more followed the mass in the street. Shenouda’s body has been taken to the St. Bishoy monastery, Shenouda's favorite church, to be buried in the desert northwest of Cairo. While leading Egypt's Coptic Christian minority for over 40 years, Pope Shenouda managed to maintain a balance between protecting Christians’ interests in Egypt and avoiding pressing them too hard in order to prevent Muslims’ anger. An interim leader of the Coptic Church is expected to be picked within a week, but the process of choosing Shenouda's successor could take up to three months. At this point it is hard to imagine who could replace a man who had been protecting Christians’ rights for such a long time. Shenouda gave Mubarak's government the strong support of Egypt’s Christians, but in recent years many liberal Christians accused Shenouda of doing too little to stop discrimination against the Christian minority. At the same time, conservative Muslims often accused Christians of seeking to take over the country, converting Muslim women and stirring sectarian violence. ­Tension between Muslims and minority Coptic Christians has simmered for years, but has worsened since the revolution last February. The uprising empowered Salafis and other conservative Islamist groups, which had been repressed under the former president. During the parliamentary elections, the Coptic Church urged its followers, about 11 per cent of the population, to vote for secular-minded parties so as to balance the Muslim dominance in the parliament. 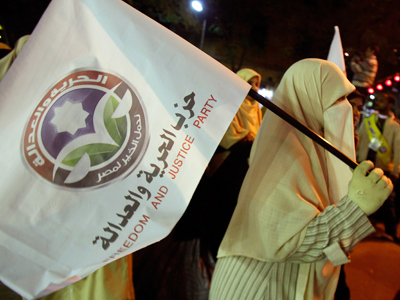 In the elections which started in November 2011 and finished in February 2012, the Muslim Brotherhood won over 50 per cent of the seats, with ultraconservative Salafis getting a further 20 per cent. Over the last year, several churches have been attacked by mobs, and dozens of Christians were killed in violent clashes on the streets. 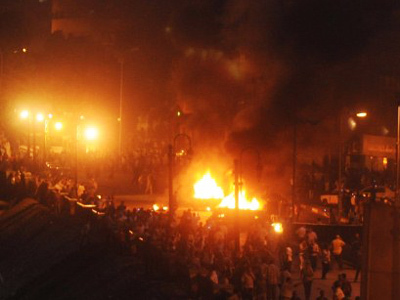 The government generally blamed the violence on the enemies of the revolution, denying any religious basis. 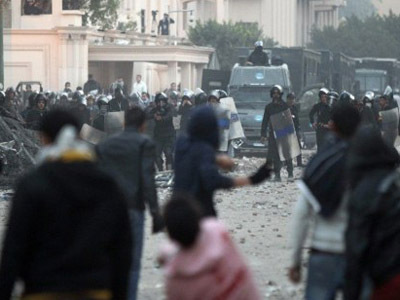 The most violent tragedy happened at a demonstration on October 9, 2011, when at least 26 people were killed and more than 300 wounded in clashes between Coptic Christians and military police. Christians were protesting against the ruling military’s indifference about increased anti-Christian attacks and discrimination. 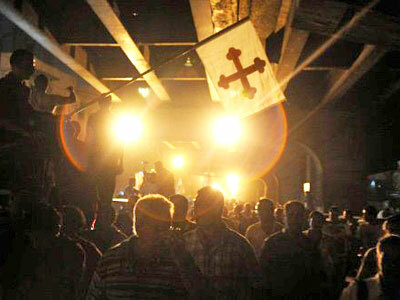 Only several days before the massacre, a Christian church was destroyed and partly burned south of the city of Luxor. Earlier, in May, Muslim protesters had tried to storm the St Mena's church in Imbaba, claiming that Christians were holding against her will a woman who had converted to Islam and married a Muslim man. At least 12 people, including no fewer than four Christians and six Muslims, died in the violence. 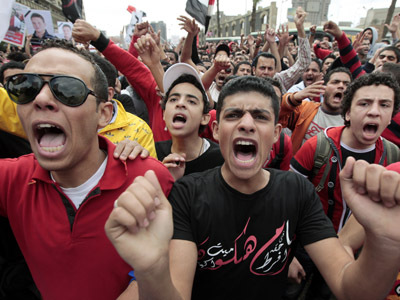 Still, the Muslim Brotherhood is seeking a unity between Muslims and Christians. After the death of Pope Shenouda, the Brotherhood’s chief, Dr. Mohamed Badie, called on all Muslims to pray for their Christian brothers.